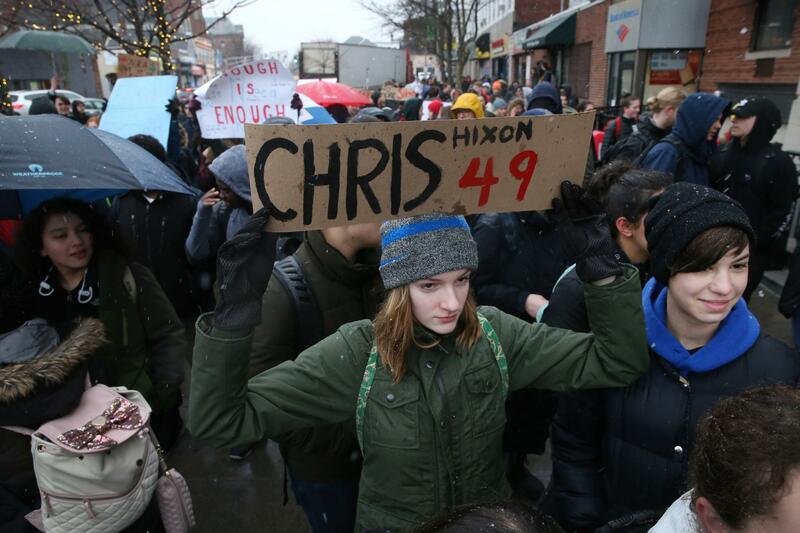 Freshman Lily Hall of Cambridge Rindge and Latin School carried a sign honoring school shooting victim Chris Hixon during a rally at Union Square in Somerville on Wednesday. 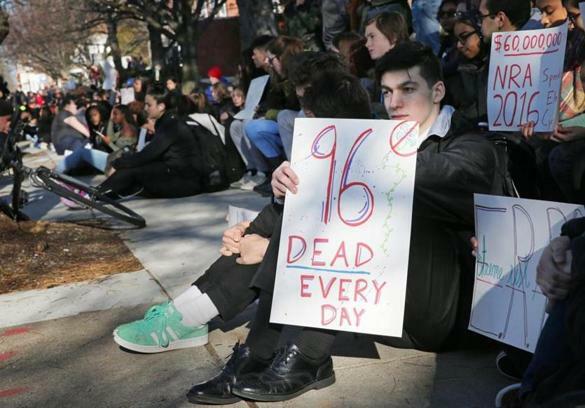 CAMBRIDGE — Hundreds of students walked out of local high schools at 8:17 a.m. Wednesday and observed a 17-minute silence to protest gun violence in schools and demand new laws to help make children safer. Organizers from the group Students Against Gun Violence chose the number 17 in memory of the 14 students and three adults killed last month in a shooting rampage at Marjory Stoneman Douglas High School in Parkland, Fla.
At Cambridge Rindge and Latin School, more than 400 teenagers gathered solemnly in the frigid morning air, some leaning on classmates for support, as snow heralding the approaching nor’easter began to fall lightly upon their knit hats and hooded sweat shirts. Eloise Botka, 17, was one of the organizers of the Cambridge walkout. 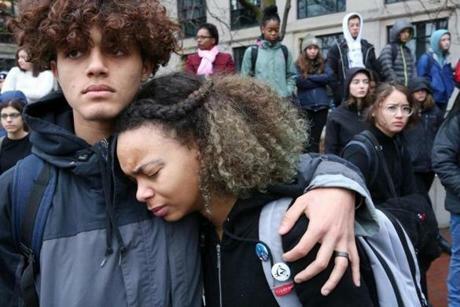 As she marched with her schoolmates after the silent protest to meet peers from Somerville High School in Union Square, Botka said students in many American schools don’t feel safe or comfortable. Somerville High students helped plan Wednesday’s walkout, which followed one at their school last week. 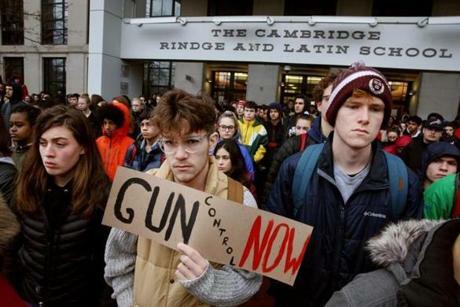 Their second walkout expanded not just to Cambridge, but also to Medford and Arlington, and many other area schools plan to join next Wednesday in a national walkout. Perella said students who only participated in the campus protest would not face consequences. The headmaster said he spoke to the students who had left campus after they returned. Perella said the school supports student activism, but he also has concerns about safety. Sam Dornstein, 15, one of the organizers from Somerville High, said students will continue building their movement, and after next week’s walkout, hundreds of teenagers will visit the State House to lobby legislators in person. “We as students, across the Boston area, across Massachusetts . . . are not going to stop until we see the action that we feel is going to make our places of education safer,” Dornstein said. 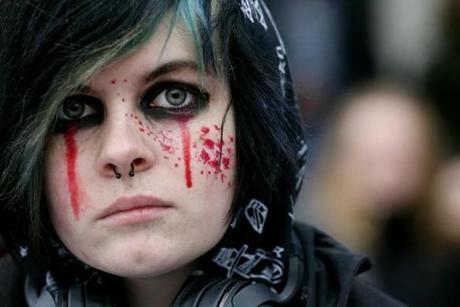 The students are part of a movement born in response to the massacre in Florida, where outspoken survivors have become activists demanding better protections for schools in a nation where mass murders in classrooms have become routine. As they huddled together in Union Square under canvas canopies in the freezing rain, Cambridge and Somerville students phoned members of the state Legislature’s Committee on Public Safety and asked them to support a bill that would allow the use of extreme risk protection orders to bar gun possession for those deemed by a judge to be dangerous to themselves or others. Cambridge student Sam Peck, 17, called the first senator on a list handed out at the protest and left a voicemail. “I don’t know how much it’s going to get heard, but if enough of us keep calling, hopefully we’ll get through,” Peck said. Nearby, Cambridge student Josh Dunbar, 16, held a sign bearing the name Alyssa Alhadeff and the number 14 — the name and age of one of the teens killed at Stoneman Douglas High. Cliff Lucien, 18, said active shooter drills had become a regular part of school life after the Sandy Hook massacre, and he’s always aware that he could be in danger. Sophomore Kayden Conelly joined the hundreds of students that walked out of class at Cambridge Rindge and Latin School. Hundreds of students at Cambridge Rindge and Latin School walked out of classes. Junior Nigel Wallace comforted Freshman Aleyana Pina during the student walkout.